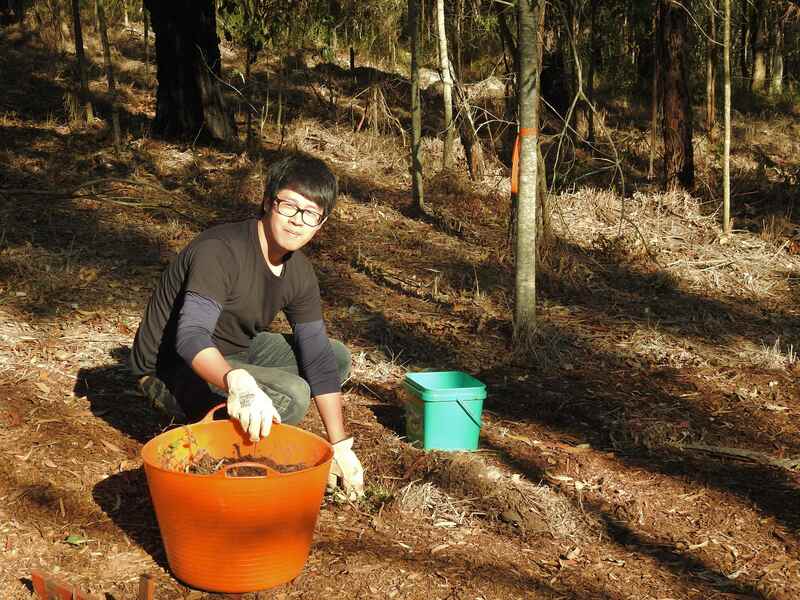 Louis Cheng, a Griffith Uni Environmental Science student, joined Marshal and myself at Fox Gully Bushcare today to finish spreading the mulch and plant native grasses at the small bird habitat planting site. Planting Creeping Beard Grass Oplismenus aemulus creates a cover of Living Mulch that will retain water, stop erosion, control weeds and create a micro-climate that keeps the soil cool allowing the development of a healthy soil ecosystem with fungi, bacteria, earthworms, curl-grubs and bush cockroaches all working together to renew the very foundation of our forest. 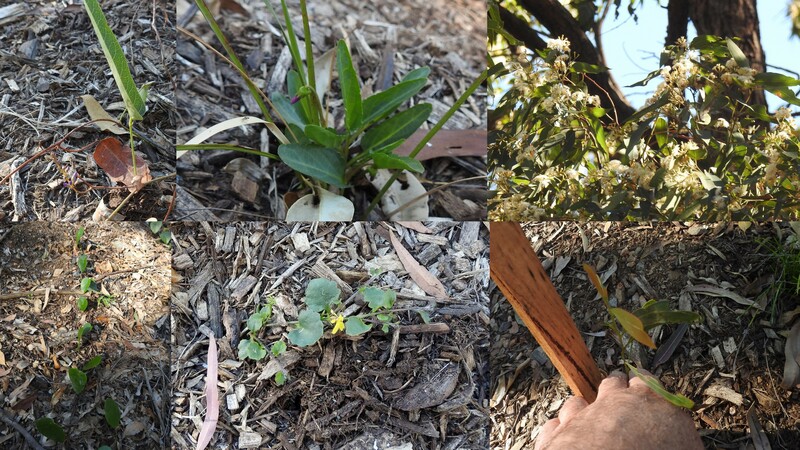 The site, planted just a month ago on National Tree Day, is already showing fresh growth with Native Sarsaparilla Hardenbergia violacea, Star Goodenia Goodenia rotundifolia, Ivy-leaf Violet Viola banksii and new Acacias all producing fresh shoots and in some cases flowering. The natural regeneration of the site is also increasing with Tape Vine Stephania japonica spreading and the Tallowwoods Eucalyptus microcorys in full flower overhead. 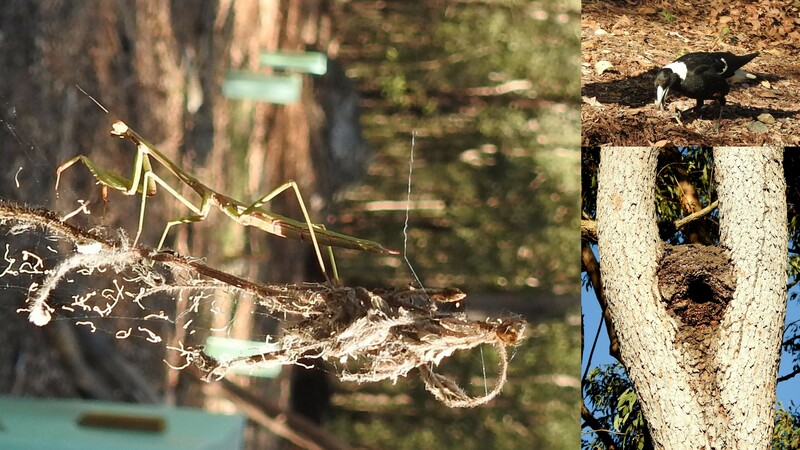 The local fauna is also moving back into the site with Purplewinged Mantid Tenodera australasiae exploring the bushes, Australian Magpies Gymnorhna tibicen feeding on insects in the mulch and a new Kookaburra Dacelo novaeguineae nest hollow being excavated in a termite nest. 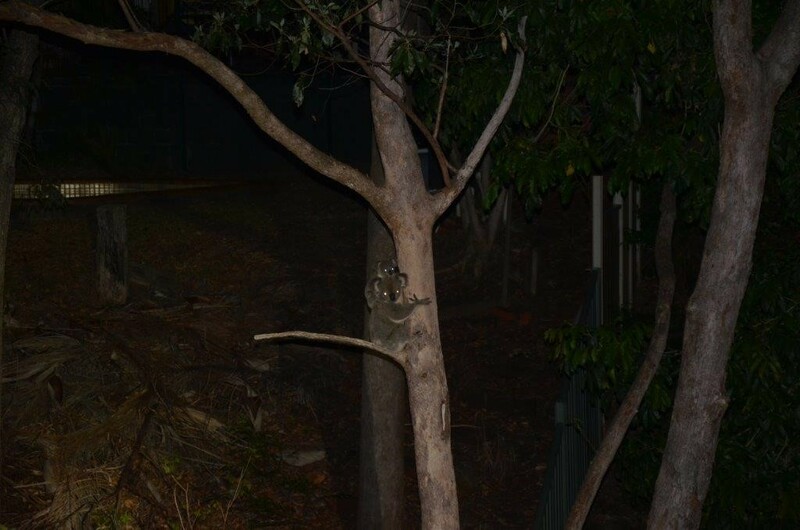 Things can be a little noisy at night in Fox Gully with Kenny, Jenny and her joey as well as what seems to be another young Koala in residence. 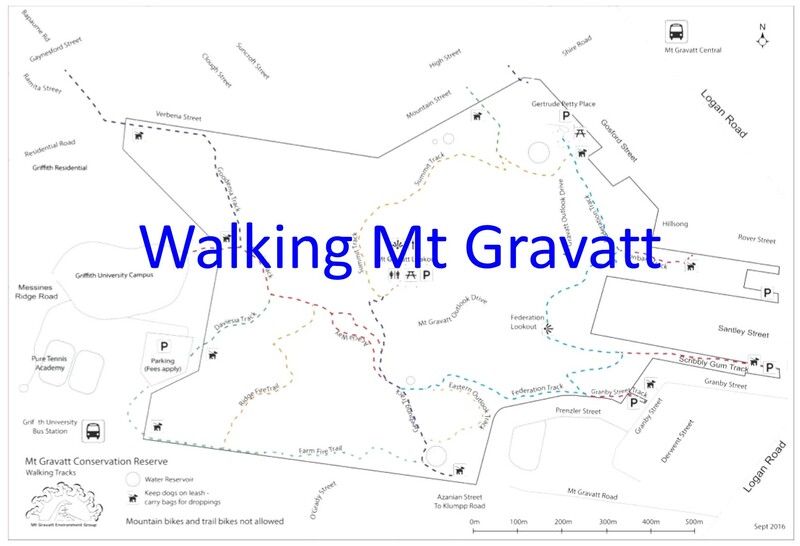 It is a real pleasure to walk in the bush and see Koalas and even more amazing when you don’t even have to leave home. 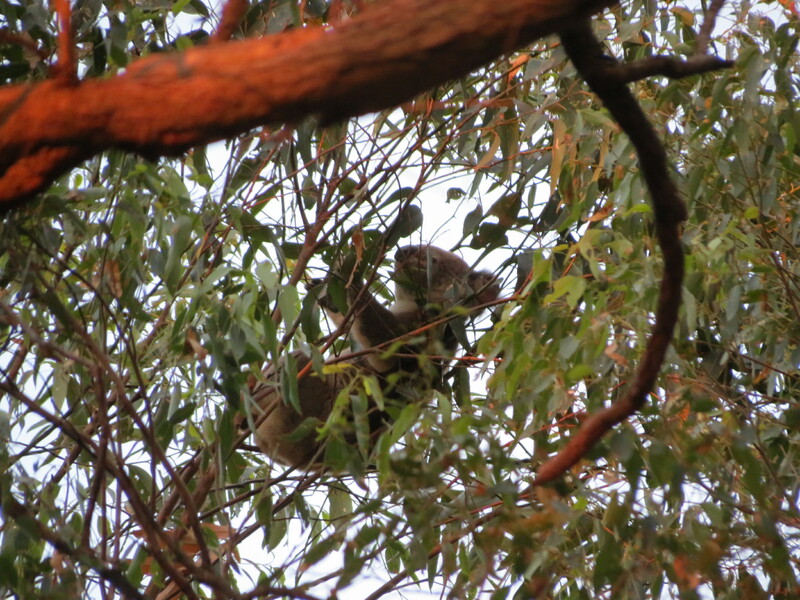 We were sitting outside on dusk yesterday when I noticed this Koala climbing down one of the big Tallowwoods Eucalyptus microcorys. Disappearing on the ground it soon reappeared climbing a another much smaller eucalyptus. The new leaves at the very top were the target. 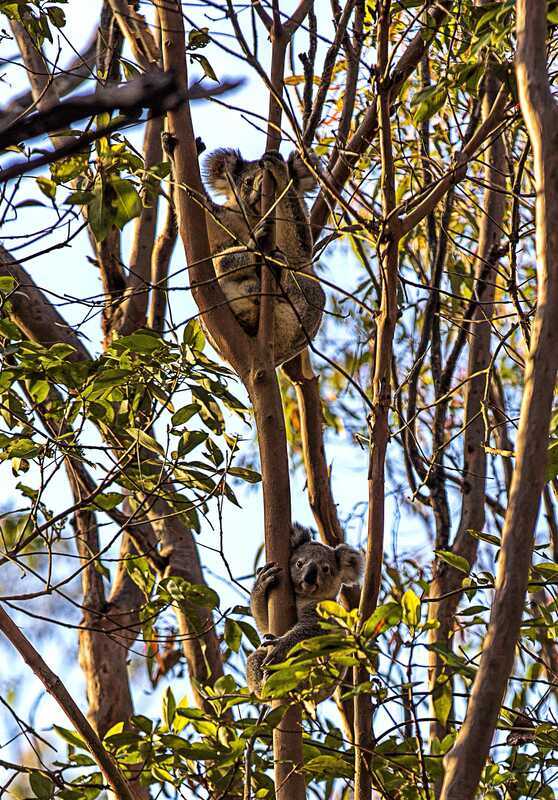 Don’t worry that the branches are very thin and Koalas are solid weights. Settling in among the very top branches sitting on something that would be less that 2cm thick our young visitor started reaching out for dinner of gum leaves. 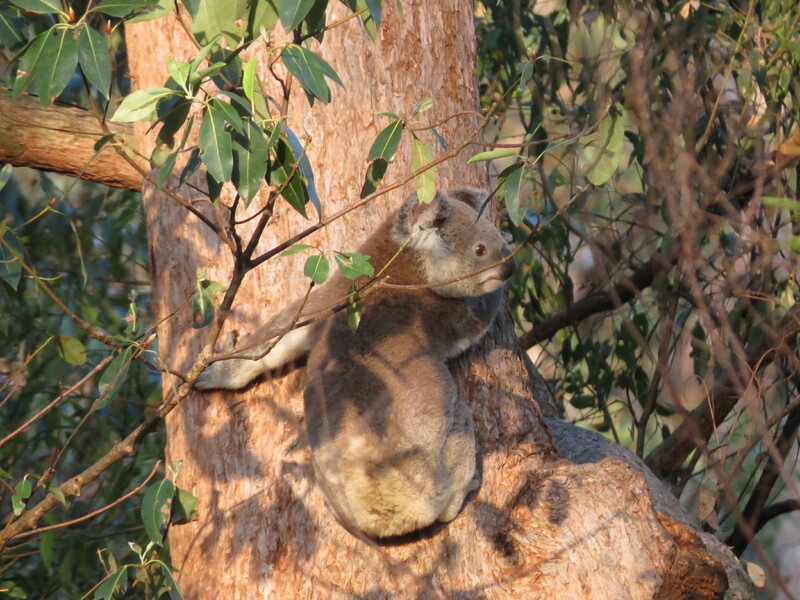 On Sunday we spotted a Koala mum and joey just beside the Farm Fire Trail. Then later that night I received a text message from Miranda whose Arafura Street property forms part of the Fox Gully wildlife corridor. The Koala mum (Jenny) and joey were in their favorite tree and Kenny the father was around making his usual grunting noises.